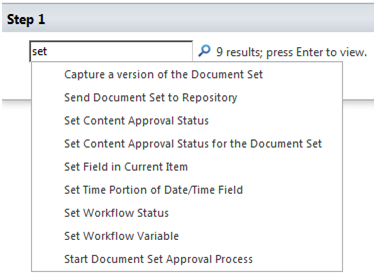 While creating a Workflow “Start approval process” from the SharePoint Designer I got some major error where the Workflow don’t reject the reply from the users and just jump further to the next step. Isn’t that some wrong, while I am using if-else branch where I want workflow to find out either the threat is approved or not. If not do something and if reject don’t do anything. In my scenario it will not hit the Reject process cos to reject is not activated. In my post I will show how to set the Workflow to be trigger for the reject process too. Add action “Set workflow variables”. Now the approval workflow makes sense. This entry was posted in SharePoint Designer 2010, Uncategorized and tagged workflow by Rizwan. Bookmark the permalink.